This is the view of the west side pier at the mouth of the Oak Orchard Harbor at Point Breeze, NY in 1871. 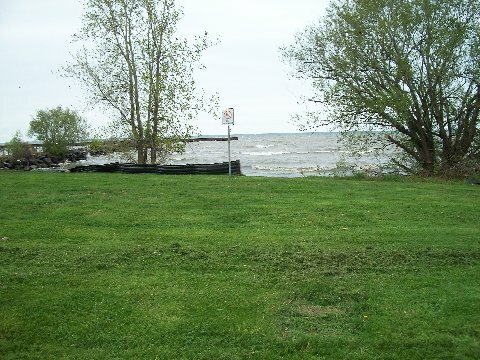 Point Breeze is located on Lake Ontario in the Town of Carlton just north of my home town of Albion, NY. 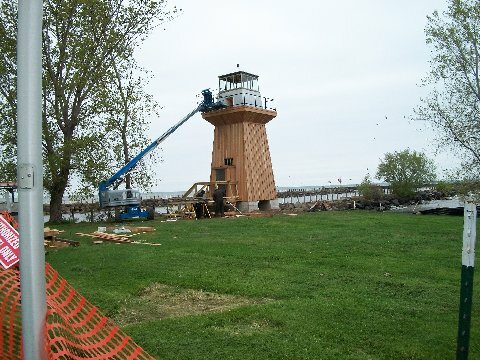 The lighthouse, as it is pictured here, was in place until 1916. A community non-profit organization is in process of rebuilding it. I’m so excited and can’t wait to see the finished structure! I love being on or near the lake and especially love Point Breeze. I almost always include a drive to the Point when I travel up home for a visit. My Grandparents had a cottage on the lake at Sunset Beach near the Point and I cherished the time I would spend there as a child. We had a circle of friends who spent their summers there that we grew up with. I remember many, many warm summer nights playing kick the can, hide ‘n seek, and roasting marshmallows and pies around a campfire. In my teen years, I discovered how tranquil and calming being near the water was. I spent a lot of time sitting on a bench at the edge of the cliff that overlooked the lake – just sitting there thinking, listening, and writing poetry. One summer in my early 20s, my friend, Greta, and I rented my Grandparent’s cottage and stayed there for a few months. It was a great summer – we rarely had a weekend that we didn’t have a crowd there for a party! 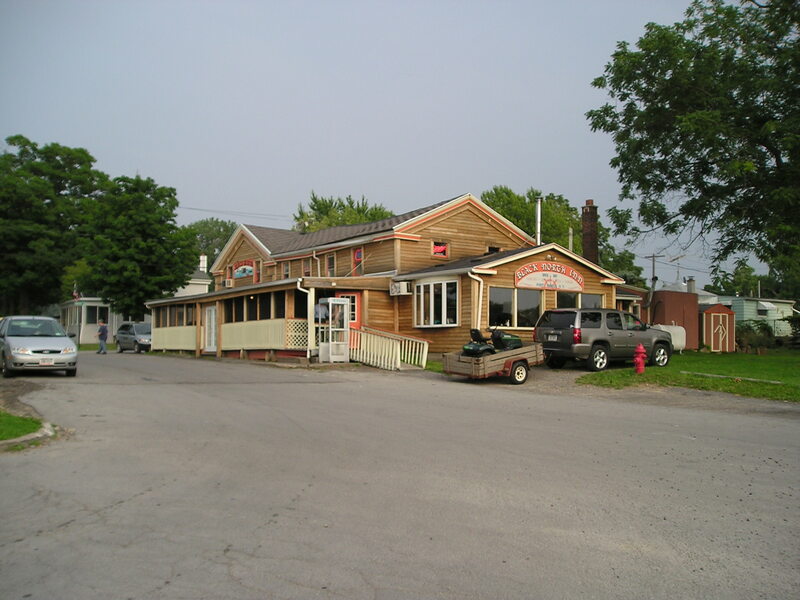 The memories moved to Point Breeze in my 20s – many nights sitting on the porch of the Black North Inn with some cold beers watching the boats enter and leave the harbor. Then, when I started dating Ronald, we’d take his sons to the point and the harbor to fish and feed the ducks. Given all that, I was so happy to hear that a group was raising funds to rebuild the lighthouse that was at the Point from 1871 to 1916. The lighthouse and keeper’s house were built in 1871. 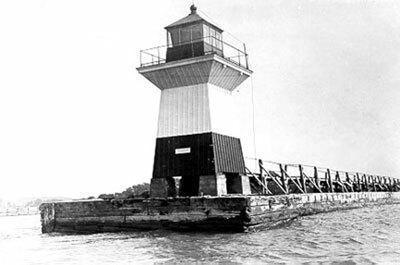 The light was visible for nine miles and safely guided ships from the lake into the harbor. It was maintained by the US Government until 1905, when it was left abandoned. A storm caused major damage in 1914 and another storm washed what remained of the building away in 1916. The keeper’s house remains and is now a private residence, but photos is all that remain of the lighthouse. Since I made a donation to the fundraising efforts, I get a newsletter from them from time to time with info and progress updates. I received one today and read about another historic link to the Oak Orchard Harbor that I found fascinating! It is about another favorite spot to visit when I go home – Brown’s Berry Patch! This is a family owned farmer’s market with wonderful fresh fruits, vegetables, and berries. They have a great gift shop and ICE CREAM!!! Apparently, the Brown family holds a prominent spot in the events that took place in the Oak Orchard Harbor during the War of 1812. I had to do some more research to get the whole story. Bathshua Brown was the widow of Elijah Brown. They married and lived in Connecticut in 1774-1776, when the British took their livestock and supplies and burned their home and farm during the Revolutionary War. 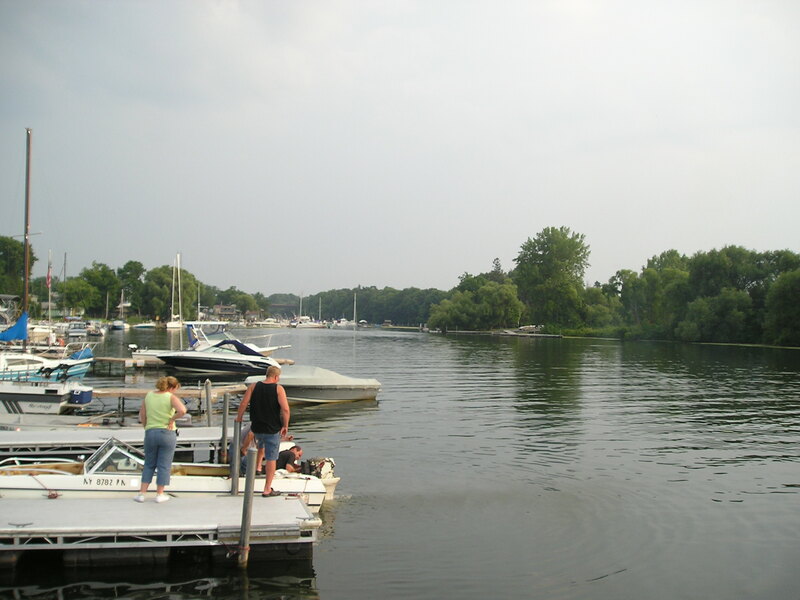 Over the next 28 years or so, they moved around and finally settled on a 100-acre farm along the Oak Orchard River on the south shore of Lake Ontario in 1804. Elijah, unfortunately, died during the move, which left Bathshua and her 12 children (five sons and seven daughters – the remaining of 16 children born to Elijah and Bathshua) to work the farm. During the War of 1812, British war ships patrolled the Lake Ontario coast to hinder commerce. A British Captain was captured and taken to Bathshua Brown — as it turned out, he was the same British Captain who lead the soldiers who burned her home in Connecticut in 1776! She gave him three choices: be turned over to the American forces; allow her sons to have at him; or return to his ship and never come back again! He was never seen again! The farm, Orchard Dale Fruit Farms, has been successful and kept in the Brown family for all the generations since Bathshua and her 12 children settled there over 200 years ago! Brown’s Berry Patch was opened by the family in 1984 and has been a thriving business ever since — I never stop in there without finding it crowded with shoppers! I continue to be amazed by the history and legacy of the area I grew up in and that provided so many wonderful memories for me! 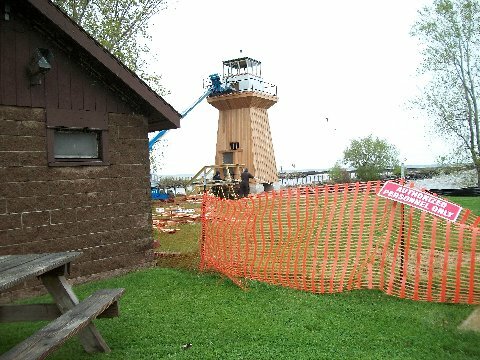 Research Credits: The majority of the historical information used in this post was found on the Oak Orchard Lighthouse Museum and Brown’s Berry Patch web sites.